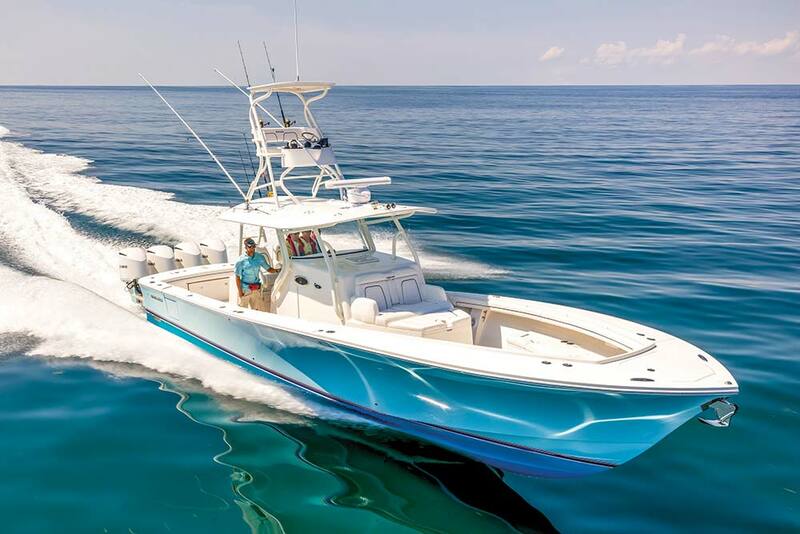 Regulator Marine unleashes their largest center console yet and tempts sportfisherman buyers to reconsider. Actual boat owner experience shows Maxwell was right. 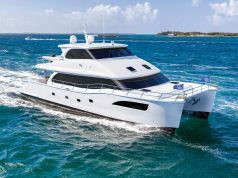 Chris Hall Sr., the chairman of Bluewater Yacht Sales and the owner of the first Regulator 41 off the line, has crisscrossed Florida in the 41 and has also run her up and down the East Coast. In early June, he ran 120 miles from Hampton, Virginia, to Annapolis, Maryland, simply for lunch. “It’s not just the speed but the ride,” Hall Sr. says. “It is so comfortable and easy to handle, it changes the game. You can cruise in the mid-40s comfortably even when the conditions are less than ideal. 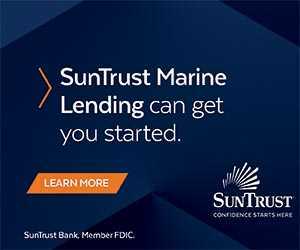 I’m a big boat, Viking guy, but this boat has widened my horizons for sure.” The ability to run at such speeds with confidence rests on the hull and deep-V entry with a 24-degree deadrise. 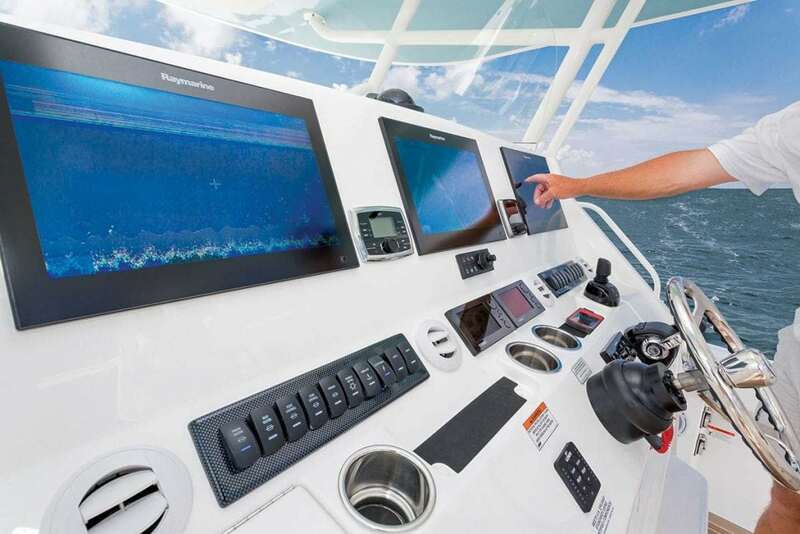 Regulator naval architect Lou Codega took about a year to complete the design of the new 41, and it was built specifically for Yamaha’s Helm Master system. 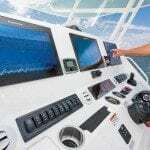 Helm Master offers joystick control for easy low-speed maneuvering around the docks as well as speed control, which is like cruise control for your car. Speed control locks in the rpm and then you can step up the rpm by 15 percent or down 10 percent with the touch of a button. 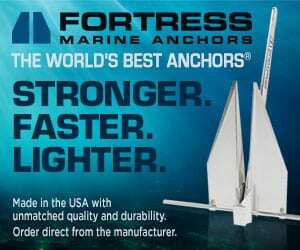 The builder is well known for constructing boats that take on the roughest water, and it all begins with the “grillage system”, a molded fiberglass stringer system that adds to the hull strength. Bonded to the hull, the grillage system reduces stress at the deck, liner and hull joint, while foam is injected into voids to absorb noise and add strength. A super-strong polybond adhesive system joins the grillage, liner and hull and allows it to function as a single piece. 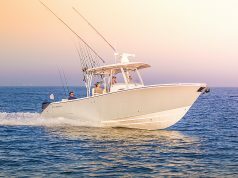 Because Regulator owners are determined to fish in any weather, they will square off with rough, confused seas, and the 41 performs with nary a shake or rattle. Size does matter on a fishing boat, and while the Regulator 41 has an LOA of 41′ 3″, with the engines and Armstrong bracket the boat measures out to an actual 47′ 3″. That configuration offers a huge amount of space in the cockpit—enough room to mount a fighting chair as one customer has already done. 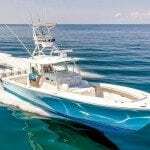 It also allows for a big and beefy rear transom, which contains an 84-gallon fish box in the center flanked by two 40-gallon live wells. 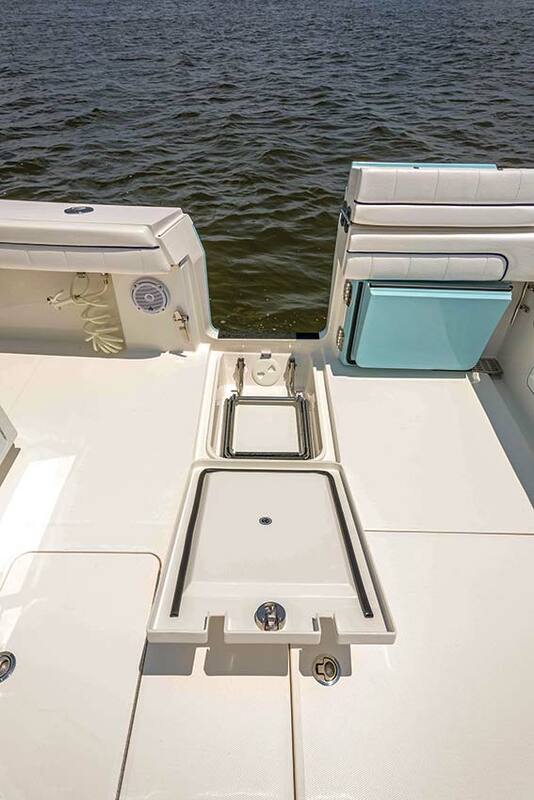 A cleverly hidden flush-folding bench seat in the transom bulkhead offers space for two people. 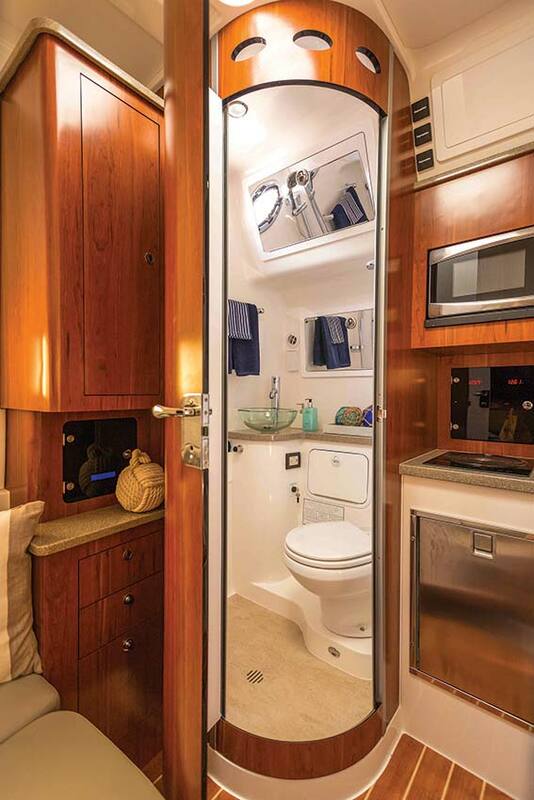 Another convenience feature is the starboard-side entry door, which allows for easier boarding at the dock. 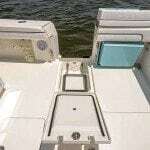 There’s also a swim ladder engineered into the deck, so with the side door open you can flip up the deck cover, unfold the ladder and then close the deck cover. Smart. On the main deck, the expansive dash on the 41 offers plenty of space for three 17-inch multifunction displays (MFDs). The three-person helm bench offers a variety of configurations for sitting or standing. The driver looks forward to an Edson polished silver steering wheel and Yamaha throttles and shifters as well as the joystick control, which is in a comfortable position for easy operation. There are no mechanical gauges—all the system data is displayed on the MFDs—and one of the only throwbacks to yesteryear is the Ritchie Compass mounted on the top center of the dash. Down below in the cabin, the powerful 10,000 BTU A/C system keeps things cool thanks to the Fischer Panda 8kW diesel generator that supplies the electricity when the engines are off. 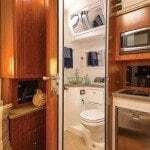 The cabin also features a 28-inch flat-screen TV, queen-size bed and generous head and shower area, as well as a galley with cooktop, microwave and freshwater sink. Storage is plentiful and the joinery is cherry wood. In addition, inside the console is a hatch that allows access to the back of the dash, so working on the electronics and their connections is a breeze. 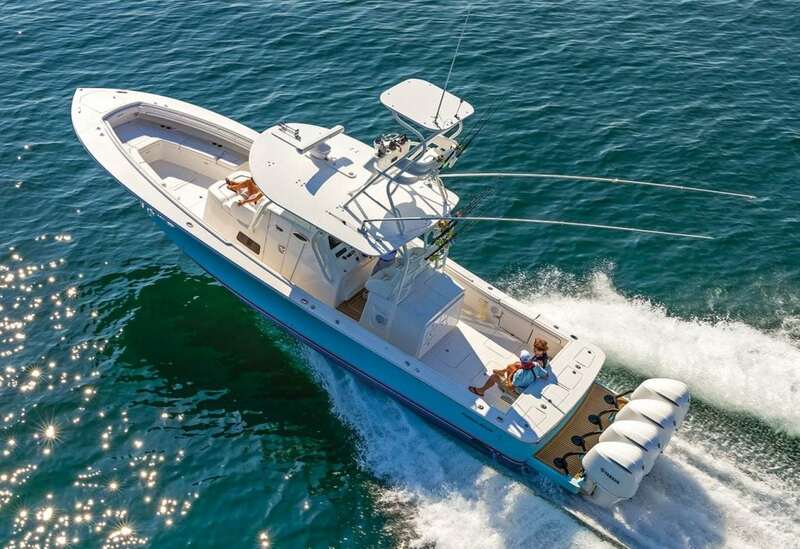 Back on the main deck, the Regulator 41’s forward bow area offers multiple areas to relax while underway and is decidedly angled more toward cruising than angling. 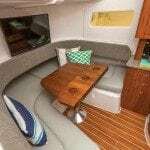 For example, the lounging mezzanine seat for two in front of the console is long and large enough to take a nap on, and the two facing bench seats on either side of the bow offer flip-up backrests. 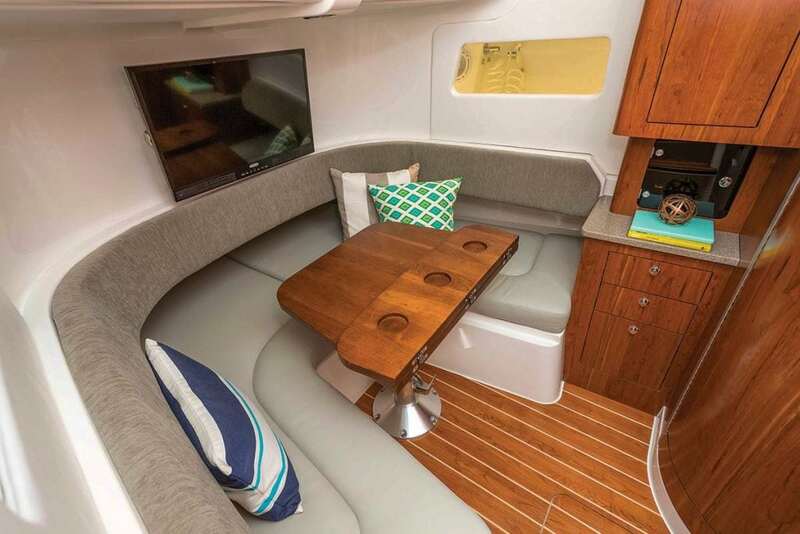 There’s also a dining table in the bow that rises electronically for meals or card games and then drops down flush with the deck when not in use. All the way forward on the bow is a windlass, compartment for the anchor chain and line, and freshwater hose.